To enter the adjustment mode, hold the RED BUTTON down while powering up the unit. While watching the green light above the DOWN button turn the rear handwheel counter clockwise very slowly until the light comes on. If the light just flashes, turn the handwheel backward until the light is on again. With fine adjustments of the handwheel the green light can be constantly turned on. 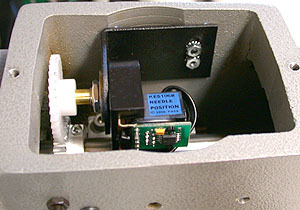 On the GAMMILL machines the needle position sensor can be found inside the arm on the top of the machine. Turn the rear handwheel counter clockwise until the point of the needle just touches the fabric on its way down. Loosen up the screws holding the sensor bracket and lift the bracket just enough to disengage the gear. Turn the white plastic wheel very slowly watching the green light above the DOWN button. If the light just flashes, turn the wheel backward until the light is on again. With fine adjustments of the wheel the green light can be constantly turned on. When the green light stays on the sensor is aligned properly. Realign the needle bracket. The gear should have a slight play when it is properly aligned. Tighten the mounting screws.